Beer and Prosecco Van. Bringing beer and bubbles on tap to your event, party, wedding or festival. Kombi Keg can dispense pretty much any drink from beer to softdrinks! 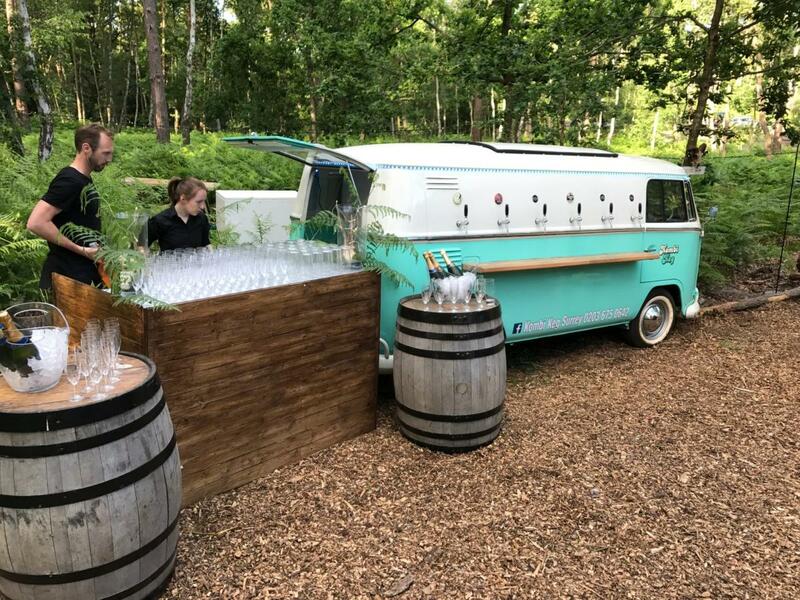 Our Camper van brings keg beer, cider and Prosecco to your wedding bar or event with class and style! We cater for both “pay bars” or “pre-paid bars”, we will have a package that fit both your requirements and your budget. Our camper van can be used both outdoors and indoors, normally in a marquee and barn! Allowing your guests to pour their own drinks is a great talking point, and makes your job as host very easy. Our 55 inch television mounted on the roof of our camper display photos, logos or even video content? We have had photos taken in a wedding ceremony available on our TV during the wedding reception! Kombi Keg makes a perfect wedding bar. We have various packages for weddings, events, birthday parties, festivals and even corporate events. Kombi Keg is the life of the party! Our bar staff make our mobile bars the talk of the party! We are a friendly, smiling bunch. Hiring our mobile bars allows you to relax in the knowledge that you and your guests are being looked after. We sister company is an event staffing agency called Ngage which provides nationwide professional bar staff at all our events, they help us to attract the highest quality catering staff in the industry! We share our preferred wholesale prices with our customers making our offering incredibly affordable! Our camper van can dispense pretty much anything, from cocktails, bubbles, mineral water, soft drinks, cider, and of course draught beer. If what you are looking for is not on our list, set us the challenge to source it! Customers can supply their own beer, whether that be a home brew or purchase from your local brewery, we don’t mind connecting it all up for you. We do love our beer though, so if you’re stuck and not sure what to order, or how much to order, give us a shout! The Kombi Keg has the capacity to dispense 6 different beers or drinks on tap, at any time.